Failure happens and sometimes failure is hard to fix—especially when the failure happens in deep space. By following NASA’s lead, we can fix failure and find success. Seeking earth-like planets, NASA launched the Kepler spacecraft. The mission went as planned for four years. Then failure caused Kepler to become unstable and spin out of control. In May 2013, one of Kepler’s four “rotation wheels” failed. Scientists feared that Kepler had become useless and the mission was over. After working through their usual options, the ingenious NASA scientists decided to harness the power of the sun. The sun’s energy pushes hard against Kepler’s solar panels. They used this “solar push” as a force to help control the spacecraft. Instructing Kepler’s three other rotation wheels to push against the solar push, the scientists stabilized the spacecraft which can now focus on specific interstellar bodies. The resurrected spacecraft made a startling discovery; some 180 light years from earth there are at least 8 planets similar to earth. And Kepler is still finding new “earths” to explore. When something goes wrong we often assume that the mission is finished. By using these three NASA steps we can fix failure and our mission can succeed. Identify the issue to be solved. So often we are distracted by the symptoms rather than the cause of the issue. Symptoms can be distracting (blood, fire, chaos), by concentrating on the core issue we identify what really needs to be solved (wound, gas line, poor business planning). The spinning Kepler craft was the symptom; the failure of stability control was the issue to be solved. Focus on resolving the issue and you’ll start moving away from failure. Seek creative solutions. Quickly run through your usual problem solving strategies and eliminate all that won’t work. 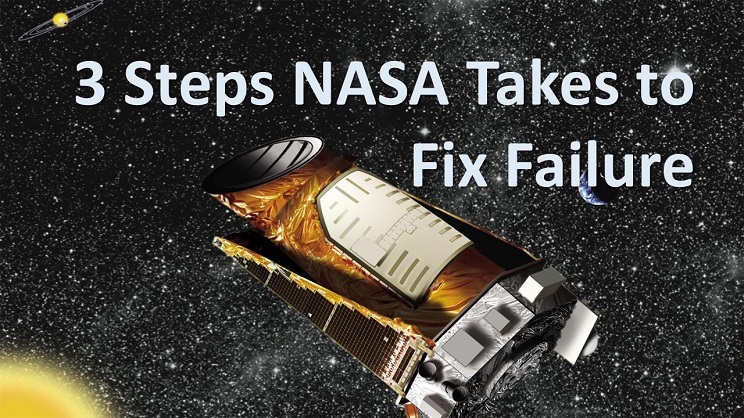 NASA couldn’t take Kepler to the repair shop. Look beyond your typical categories of resolution by asking questions that push you to explore ideas that never occurred to you. NASA asked what other forces could be used to stabilize Kepler. Look for the “solar energy” that can move you to find new solutions. When the issue is resolved—move on. So often people wallow in blame and recrimination. Failure is part of success. Rehashing the failure unnecessarily distracts us from achieving success. Once NASA fixed the problem they went on with Kepler’s mission to identify new planets and, to date, found over 4,100 unknown planets. Using the three NASA steps we harness ingenuity and initiative to fix failure and accomplishing our goals. Learn more about the Kepler mission here. Please consider making an annual gift to the Methuselah Society for Centenarians where Tim is a founding member. © 2018 Clown Clergy CEO | 630.352.6745 | WebWizard@ClownClergyCEO.com.